The Galaxy Note 9 price has already been mentioned in a couple of recent reports but there’s a new leak from Indonesia which essentially confirms speculation about how much this device will cost. The leaked pre-order poster mentions prices for the 128GB and 512GB variants of the Galaxy Note 9. It also backs up a recent rumor which claimed that the base model of the Galaxy Note 9 will have 128GB of storage. It appears that Samsung will only offer two variants of the Galaxy Note 9 this year with 128GB and 512GB of onboard storage. The leaked pre-order poster appears to be from Samsung for customers in Indonesia who might be interested in placing an order for its new flagship smartphone. Aside from mentioning the prices, the poster also lists the available color variants with their names. They include Mystic Black, Engineered Blue and Artisan Copper. The Galaxy Note 9 is expected to be available in a total of five different colors at launch. The pre-order price for the 128GB Galaxy Note 9 mentioned in the poster is 13,500,000 Indonesian Rupiahs which is around $935 going by the prevailing exchange rate. The 512GB model will cost 17,500,000 Indonesian Rupiahs or about $1,210. The Galaxy Note 9 will be priced in a similar range in other markets across the globe but it’s obviously not going to be a simple conversion from these figures. 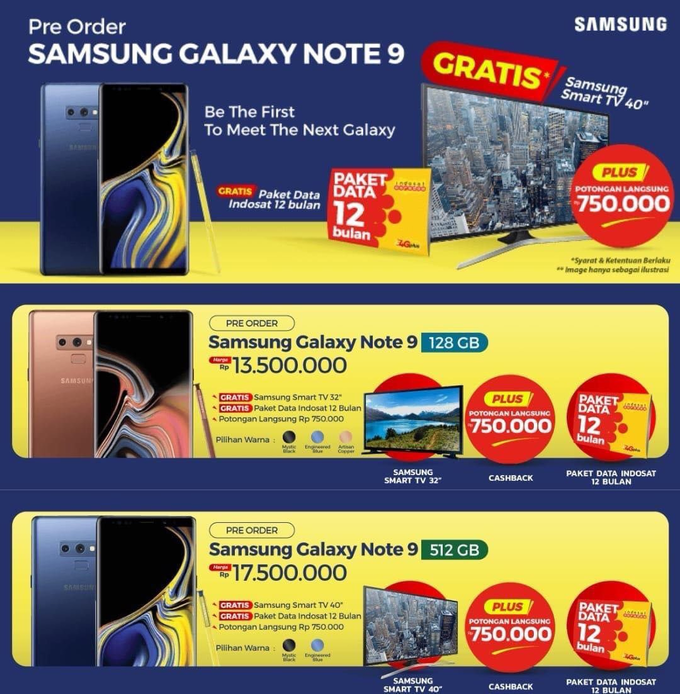 Customers in Indonesia may also receive 32 inch and 40 inch Samsung Smart TV depending on the model that they pre-order in addition to mobile data. The company offers different pre-order gifts in other markets and it is as yet unclear what it will be offering to customers in markets across Europe and the United States. We’ll come to know for sure on August 9 when Samsung takes to the stage in New York City to officially announce the Galaxy Note 9. What do you think about the expected price tag, is it reasonable enough to get you to spend your money on the device knowing everything that we do about the Galaxy Note 9? $935? That’s pretty good for 128gb.